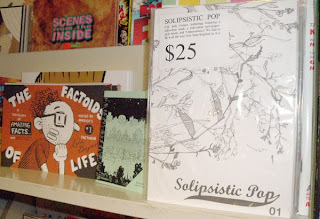 The first thing that stands out about Solipsistic Pop 01 is how professionally bound and printed it is. From what I've been able to gather from the first issue and the website this new anthology seems to be printed out of the pocket of the editor, Tom Humberstone, and possibly some of the artists within. Which blows my mind. It has colour printing! It is perfect bound! It has a fold-out Sunday comic style insert! I don't even want to think about how much this puppy cost to print. As far as design issues go, this book rivals anything being put out by the big indie houses. A very handsome volume indeed. The price might seem a bit steep at first blush but the end product well justifies the outlay. I really hope they sell the whole first run. Just the blatant love of printing and sequential art that exudes from the entire volume makes it an endeavor well worth supporting. And while I rejoice that there is now a quality UK comics anthology to highlight all the great and largely unknown (at least in US indie comic circles) talent. I am hugely jealous that I will not be able to submit anything to a rag of this quality! Well done Mr. Humberstone. I am now a faithful believer. The line up for issue two is looking amazing! Yeah because you are in it! It talks to me . . .